Ensure the person knows that you are using them as a reference. When an employer asks you to provide your references, let them know that they may be getting a phone call. I can tell when I have called a reference that is caught off-guard either because they weren’t expecting my call, or they may not have been aware that the person was using them as a reference. The person may have given you permission to use their name in the past, but it is important to always keep them updated on your job search, so they are prepared. If they are expecting the call, they will be more able to provide clear and concise answers, which will reflect more favorably on you. Make sure that you are being equally represented. Highlight your skills and strengths from all angles, by having various references and keeping ties with them. According to Julie, “We typically ask candidates to provide a reference from a former boss, a peer and a direct report. Each year, make sure that you can identify one person from these groups that will be able to give specific examples of your contributions, strengths, and leadership style.” If you find yourself in a situation where you need to ask your estranged boss from five years ago for a reference, it will be more difficult. Stay connected to your references on LinkedIn, so even though you may not have regular contact, that person will be aware of your activity and you will be in the fore-front of their mind. Send a quick email, or have a cup of coffee periodically, just to stay in touch. Properly prep your reference. 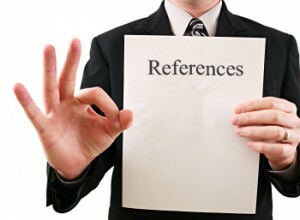 Keep your references updated on your current work situation. Make sure they have a current copy of your resume or ensure your Linked In profile is up to date. Provide information about the job you are interviewing for and let them know why you’re looking to make a change. It addition, it is important to give them an idea of some of the questions they will be asked. To make the reference interview go smoothly, make sure they can talk to your overall performance and impact on the company. Also share with them how you have improved your performance, leadership, education or skills since you two worked together. Areas for professional development are often much harder to articulate. Know that your reference will say good things about you. Make sure that your reference knows you well enough to be able to make you shine. If you did not have a good working relationship with your former boss and you don’t think they will be able to provide a good reference, consider other senior people you may have worked with in the organization. It’s ok to ask the person what they will say about you. If the person seems reluctant, they may not be your best choice. Make sure you have correct contact information and provide reference details. Your role at this point, is to do what you can to make the reference process go as smoothly and quickly as possible. Provide your title and the reference’s title at the time when you were working together, your working relationship and the company you were both working for. Include your reference’s current title and company as well. Provide current and accurate work and personal emails, work phone, cell phone and home number, if possible. I once spent several days trying to track down someone at a job they no longer worked at, but their voicemail was still connected. This definitely slowed the hiring process. Also, to help speed up the process, let the potential employer or executive recruiter know the best way to contact your reference. Let your references know that you appreciate them. Even though the person may be happy to speak on your behalf, it does take time out of their busy day. It’s important to let them know that you appreciate them. A card, a little gift or even a quick email to say thank you and update them on the outcome can go a long way. This person may have been the reason why you got the job, and it is important to keep them in you corner!